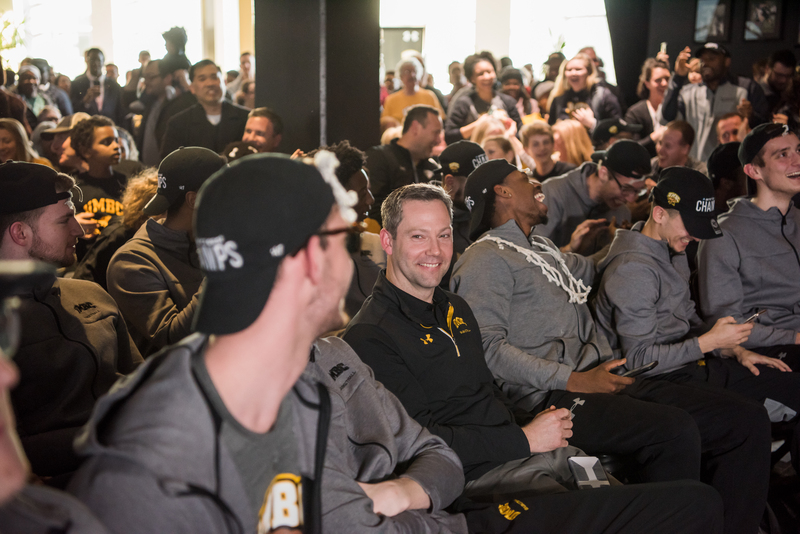 Decked out in black and gold, Retriever fans cheered ecstatically on Tuesday afternoon as the UMBC men’s basketball team set off for game one of the NCAA tournament—the team’s first in a decade. The team now heads to Charlotte, North Carolina to take on the University of Virginia (UVA) on Friday, March 16 at 9:20 p.m. EST (see full game details). 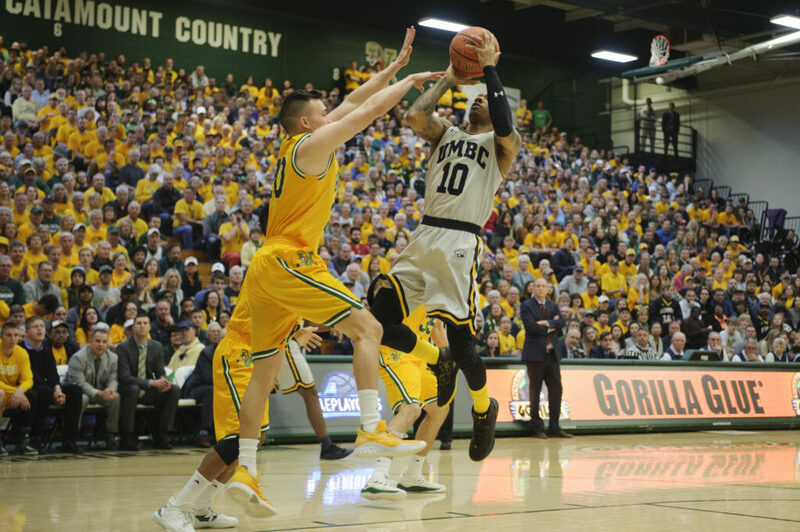 The game follows a stunning 65-62 victory on Saturday, March 10, where UMBC dethroned the University of Vermont (UVM) and took the America East Championship crown for the first time since 2008. Jairus Lyles ‘17, sociology, M.A. ‘18, education, led the Retrievers with 27 points. The NCAA called his winning three-point shot, made with just seconds on the clock, “March Madness at its finest,” and video of that moment has been shared by everyone from ESPN Sports Center to Sports Illustrated. Lyles takes a shot during the America East championship game. Photo courtesy of America East. 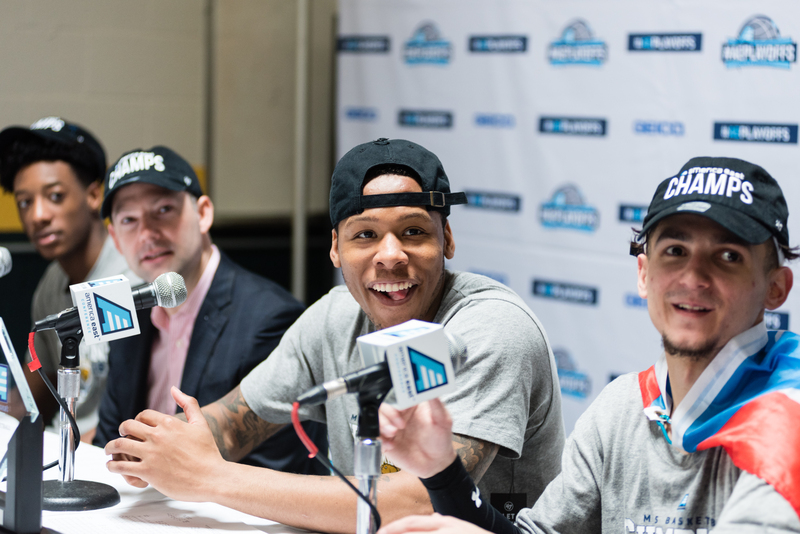 UMBC men’s basketball players and Coach Odom (second from left) at presser following America East Championship victory, March 2018. Photo by Ian Feldmann for The Retriever (with permission). Since the win and the announcement that UMBC would take on No. 1 seed UVA next, there has been even more news for the team to celebrate. 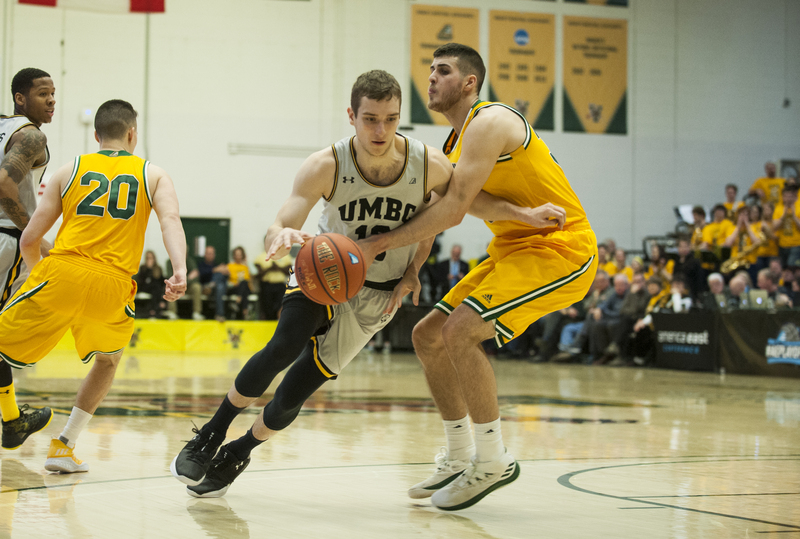 UMBC’s Joe Sherburne ‘19, financial economics, has been named to the Academic All-America Division I Men’s Basketball First Team. 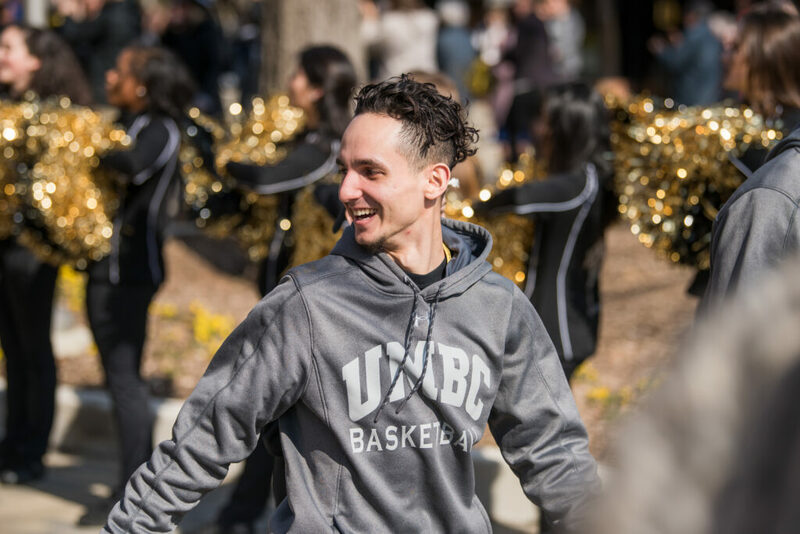 Sherburne is the first UMBC player and first America East player to receive this top academic honor in NCAA Division I men’s basketball, selected by the College Sports Information Directors of America (CoSIDA). Joe Sherburne in America East championship final against UVM. Photo courtesy of America East. Sherburne has also received America East All-Academic honors, earned the America East Elite 18 Award as the student-athlete with the highest cumulative GPA in the America East championship, and, for the second year in a row, was named to the Academic All-District 2 Men’s Basketball First Team, which is comprised of players in Maryland, Delaware, Kentucky, New Jersey, Pennsylvania, and Washington D.C.
Now in his junior year, Sherburne has climbed to 19th in UMBC’s all-time list of men’s basketball top scorers, earning 1,077 points to date, while maintaining a 4.0 grade-point average in financial economics. He is the eighth student-athlete in Retriever history to earn NCAA first team honors, the last being men’s soccer player Billy Heavner ’17, who also majored in financial economics. Joe Sherburne (center) and teammates react to NCAA bracket news. Photo by Marlayna Demond ’11 for UMBC. 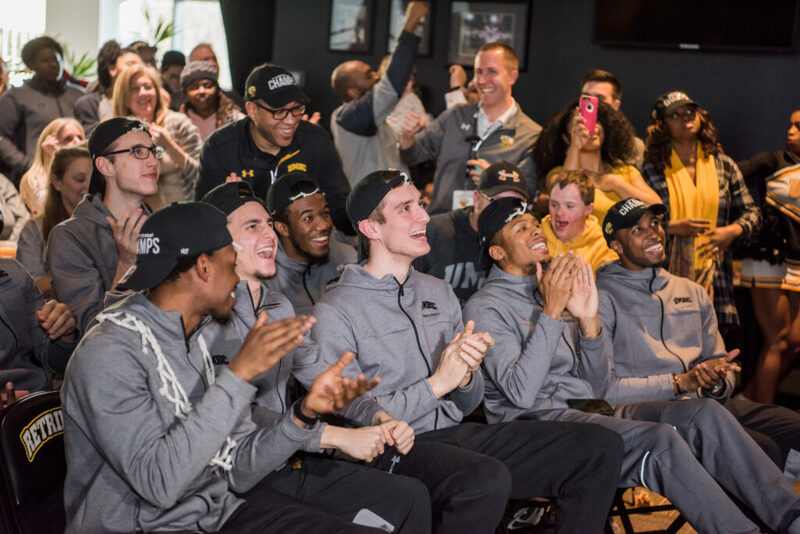 UMBC men’s basketball team reacts to announcement of NCAA bracket, March 2018. Photo by Ian Feldmann for The Retriever (with permission). 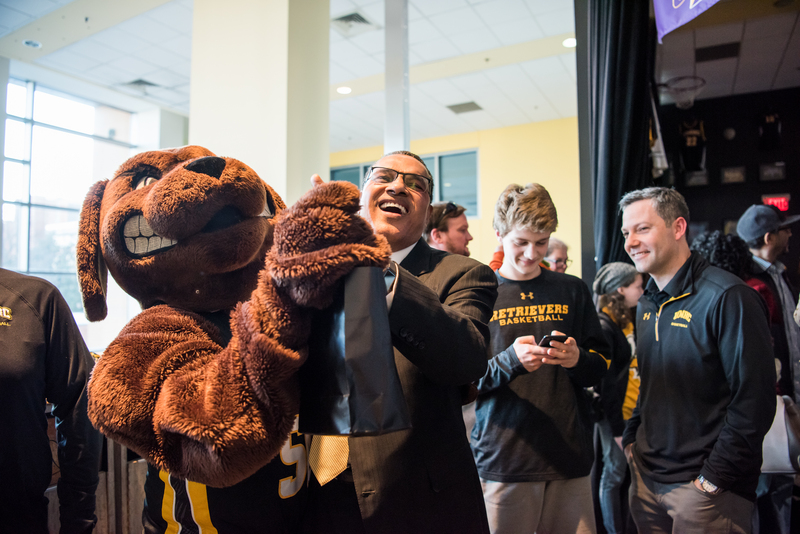 UMBC Pres. Hrabowski with mascot True Grit. Photo by Marlayna Demond ’11 for UMBC. K.J. Maura at men’s basketball sendoff. Photo by Marlayna Demond ’11 for UMBC. Coach Odom on Selection Sunday. Photo by Marlayna Demond ’11 for UMBC. 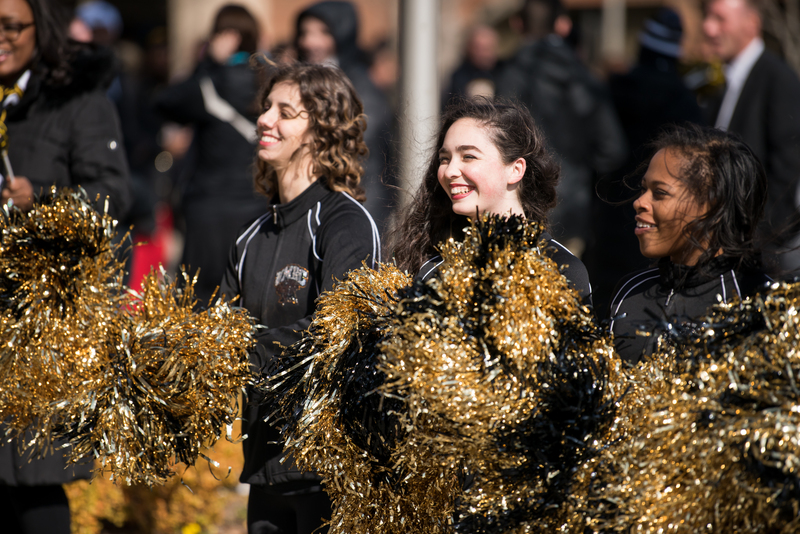 Cheerleaders at UMBC men’s basketball sendoff. Photo by Marlayna Demond ’11 for UMBC. #RetrieverNation fans believe in the team, too. In addition to students and alumni cheering them on in North Carolina, fans are also planning watch parties on campus and across the Baltimore region. 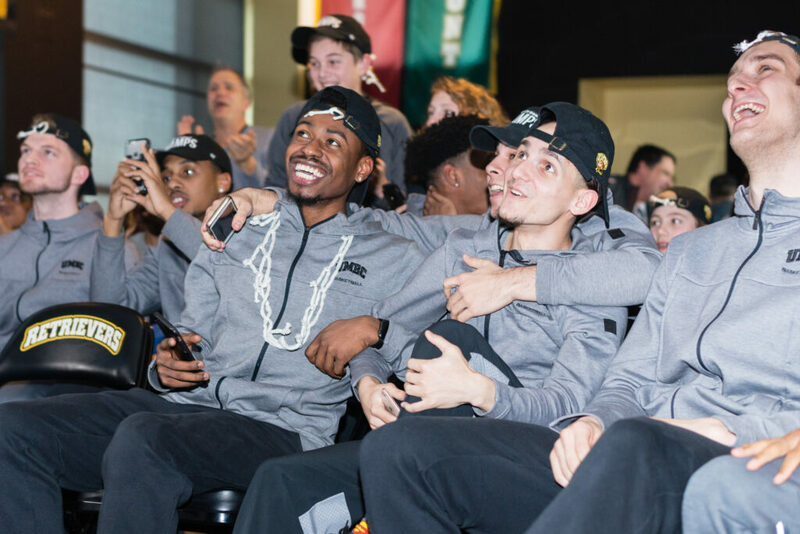 For full information on UMBC’s trip to the NCAA tournament see umbc.edu/retrievernation.